I have been working loads recently. Good for my purse but not for my skin – too many days of having heavy make-up applied, re-applied and scrubbed off when I finish has given my face a nervous breakdown. My new skin saviour is Avene’s Skin Recovery Cream. It is so gentle and soothing, and I am using it morning and night instead of my usual moisturisers. I discovered it when I was shooting on location in South Africa – the make-up artist used it regularly on sore, sunburned skin. 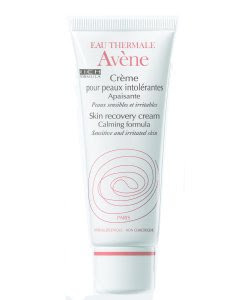 Since then, I have tried out loads of Avene products, but I think that the Recovery Cream is the best. I have been using it to remove make-up at the end of shoots too – (most moisturisers can be used in this way – the oils in the formula break up cosmetics and dirt in the same way as a cleanser does) – rather than harsh, astringent wipes and eye make-up removers. Use it on irritated or sensitive skin instead of moisturiser. This is a great product to take on holiday with you to calm sun-stressed skin, and it’s available in larger Boots stores now, which is handy!